Service Costs > How Much Does a Build-A-Bear Cost? How Much Does a Build-A-Bear Cost? Build-A-Bear Workshop, founded in 1997, was designed to allow customers to go through an interactive process where they can personalize their own stuffed animal of choice and “bring the teddy bear to life.” As the largest chain in this regard, the company has been known to donate millions to charity and create an award-winning working environment, all while offering a great creative experience for children and adults alike. As the largest chain in this regard, the company has been known to donate millions to charity and create an award-winning working environment, all while offering a great creative experience for children and adults alike. How much does it cost to build a bear at Build-A-Bear? On average, the basic Build-a-Bear animal is going to cost at least $10 to $25 without any clothing. As you add each additional piece of clothing, you will have to plan on adding a certain amount for each garment or accessory. To budget, most people spend around $45 to $80 for a bear that they are happy with that seems complete. Since there are thousands of combinations, the prices will greatly vary as will the end result. Step One: Picking out a stuffed animal $5 to $50, depending on the type, character and if it's part of a name branded collection. Step Two: Add clothing $3 to $15 per clothing option, depending on the type of clothing. Popular options include tops, bottoms and/or dresses. Step Three; Adding accesssories $1 to $10, again, depending on the accessories. A themed accessory will be much more than a simple headband. On the Build-A-Bear official website, their animals range anywhere from $10 to $25. For instance, their 15-inch Sandy Cub retails for $10, while the 16-inch My Little Pony retails for $25. The Disney themed stuffed animals retail for close to $40 without any add-ons. The popular Build-a-Bear Pokemon Pikachu can cost up to $65 for the bundle, while the Paw Patrol animals retail for $28 for the animal to as much as $65 for the bundle. This forum thread on TripAdvisor.com discussed the costs of building a bear near Disneyland. According to the responses, members said you should be prepared to spend $20 to as much as $50+ depending on the accessories purchased. 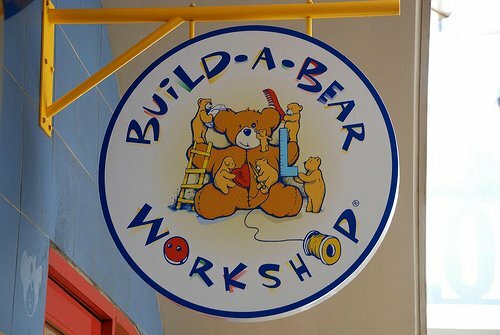 At the workshop, you will begin by picking out a bear or animal. When you pick one out, you will bring it to a stuffing machine where a small fabric heart, that you kiss ahead of time, is placed inside. This heart will be placed inside the bear before being stuffed. Once the bear is stuffed, you will be able to take the bear to the outfit section where you can pick out clothes and accessories. When the process is complete, the workshop will supply you with a cardboard carrier and a birth certificate. Common accessories that you can fit your bear with include the following: t-shirts, full outfits, purses, jewelry, pajamas, and much more. Depending on the item, some can be from brands like Sketchers and Harley-Davidson. Aside from clothing, customers are able to equip their bear with shoes, boots, glasses, headwear, pets, purses, sandals, slippers, socks and sports gear. There is even furniture that can be purchased for the animal. There are no limits to the accessories you purchase, and each accessory you add, will, of course, increase the costs. Build-a-bear has a variety of collections, including My Little Pony, Disney, Girl Scouts, Color Popz, Cody Simpson and Bright Neon. Their bears can also fit with a certain theme like Christmas, Halloween and Easter. Clothing is going to range from $5 to $25, depending on the type of outfit. For example, a simple t-shirt can cost as little as $5, while a football uniform can cost upwards of $25. In the future, you are able to go back to the store and pick out more items for your bear. For example, a pair of shoes and socks could cost an additional $10. Sounds can be added to each bear for an additional $3 to $10. This could be something that is pre-recorded, or it could be a personalized message from a loved one. Scentiments, which allow your bears to smell like certain scents, can cost around $3. You can order and create a Build-a-Bear online and have it shipped to you or to whomever you wish. Shipping may be free if you spend a certain amount; otherwise, it will be an additional cost. To maximize your experience, try to visit the store when it is not busy. This will allow your child time to make decisions instead of being rushed. Build-A-Bear is ideal for children who are between the ages of three and nine. Be sure to look out for coupons before heading to the store; they are known for having $5 off a $25 purchase. Join the Stuff for Stuff Club. For every dollar you spend at the club, you will earn one point, which can equate to a gift card. According to the point redemption, every 100 points earns you a $10 gift card, and along the way, while you earn points, you can receive freebies. At 150 points, for example, you can earn a free outfit, while at 250, you can earn a free stuffed animal. Plus, on your birthday, you will also receive a special coupon. Download the Build-a-Bear app to also receive special promotions, cool happenings at the local store and/or coupons. If you are looking for a particular bear and you are not looking to “build” one, try looking for a slightly-used one on eBay and Craigslist. You can also find some of the outfits on Amazon.com. Keep in mind that the bear and animal is not the expensive part; it is going to be the accessories and outfits that you want to buy. If you are going to bring a child, stick to a strict budget and only let them pick out a few accessories. As long as you limit your accessories, you should be able to stay within a reasonable budget. There are some off-brand clothing and accessories that will fit build a bear animals. You can even consider making your own outfit for the bear.